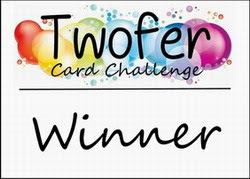 Twofer Card Challenge: Twofer Card Challenge #12 ~ Winners! Twofer Card Challenge #12 ~ Winners! 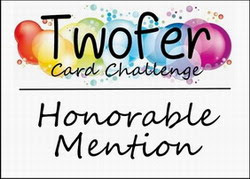 It's time to announce our Winners and Honorable Mentions for Twofer Card Challenge #12! Thank you so much for your enthusiasm and your sensational card designs! 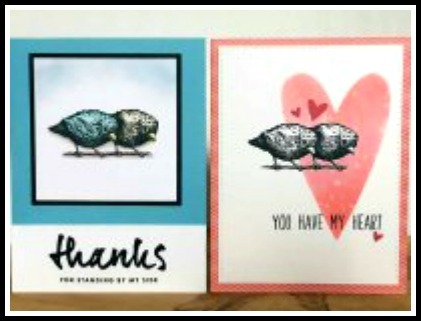 You all did a wonderful job with the BIRDS prompt and you rocked the concept of two different designs! Once again, it was such fun seeing the ways you stretched those design skills and your stamps, stencils, and dies! Congratulations to our January "Conventional" Winner! You can't help but smile and be impressed at the way Jules created these two brilliant designs! For her first card, she laid down a beautifully colored bubbly panel to ground her floating chicks while they played with bubbles. 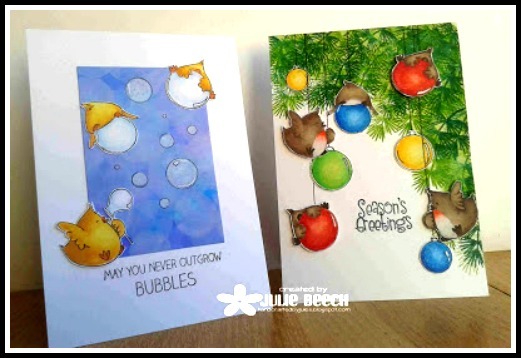 Jules then turned her chicks into robins and her bubbles into baubles and made an enchanting and expertly colored Christmas card! Congratulations to our January "Unconventional" Winner! Lucy took creativity to a new level with her two designs! Her conventional design features a stunning bokeh winter wonderland circle for her silhouette bird to admire from the evergreen tree branches. She then did a pivot and used the same bird in an unconventional way to create petals on a pretty flower for her summery thank you card! Well done, Jules and Lucy! Here is your Winner's Badge to proudly display on your blogs! I will be in touch with details about being our future Guest Designers! Congratulations to our fabulous January Honorable Mentions! Jane created two charming designs with her two owls. Her birthday fold is delightful and she showed us a great way to use patterned paper, which we all have in abundance! 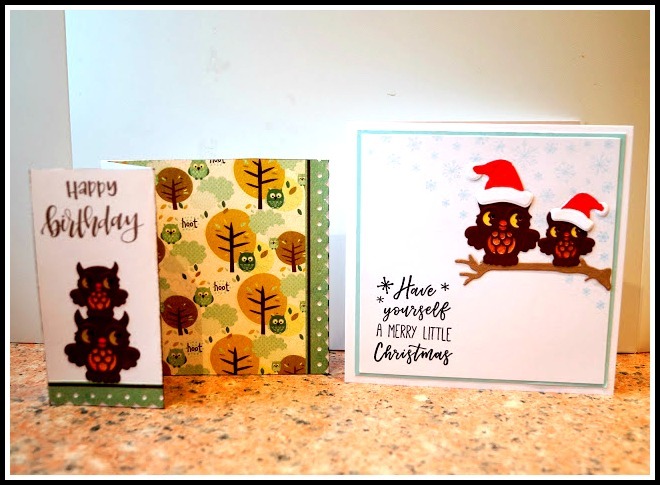 For her clean and simple Christmas card, Jane gave her owls Santa hats which made them even cuter as they sat on their branch with the snow falling behind them! 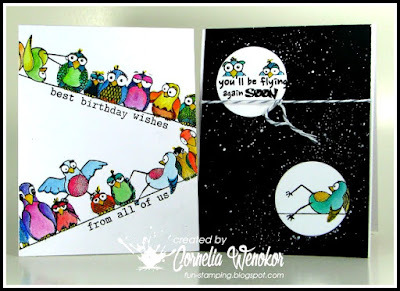 On her birthday card, Cornelia's slanted placement of the images and sentiments emphasizes the quirkiness of these vibrant birds! Her detailed coloring is sensational, but even with all her many colorful critters, the design remains clean and uncluttered. Cornelia's get well card features clever masking and die cutting to create brilliant imagery. She isolated a few birds in order to keep the sick one away from the healthy ones on separate moons! It can be difficult to come up with two different designs when working with a large image, yet Natalie managed to do that very well with this bird stamp! She kept both her cards clean and simple and very striking. Her bird duet looks at home in the wonderful blue hues of her thank you card and stepping into the pretty heart on her Valentine! 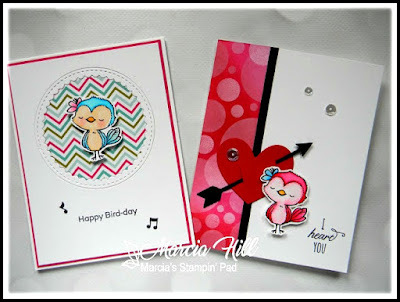 Marcia's two cards are full of joy, both in her choice of happy colors and her designs! 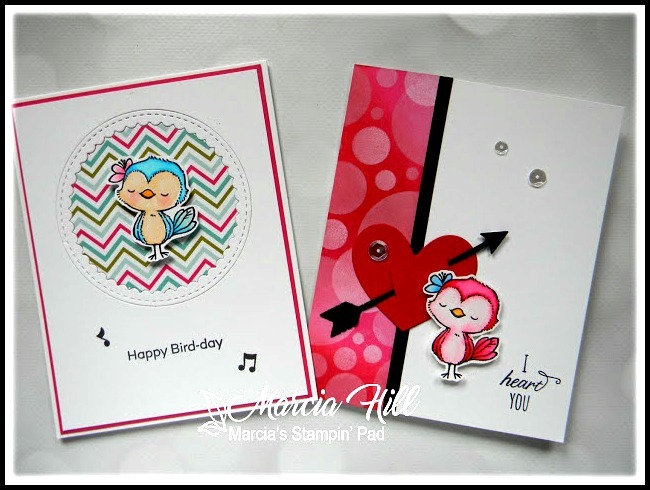 You can easily see by the simple addition of two musical notes that the bird on her first card is singing her heart out wishing someone a happy birthday! The vibrant chevron pattern behind the circle and the narrow matting make this design very clean and crisp. For her gorgeous Valentine, Marcia's sweet bird is dressed to match the fabulous bubbly bokeh border and the black and red pierced heart and arrow! 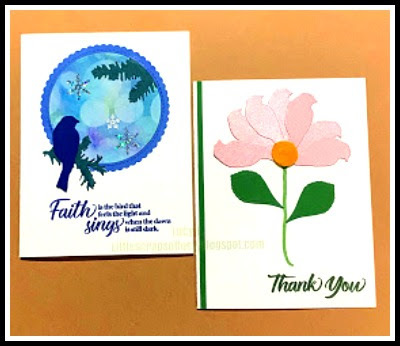 Linda provided us with nothing by whimsy and wisdom on her two designs! Is there any question that the recipient is loved and loved and loved some more in her bonkers Valentine design? 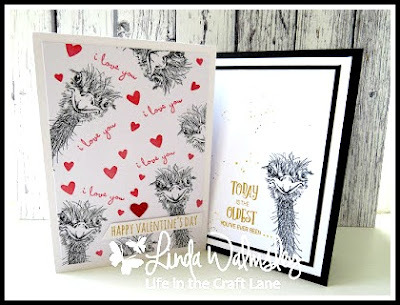 And for her birthday card, Linda managed to make that quirky ostrich look like a font of sage wisdom with her elegant matting and her profound sentiment in gold! Here is your Honorable Mention badge for you to display with pride! We look forward to seeing your creative and awesome Twofer Card Challenge designs next month! The challenge will run from February 10 to February 24, 2019. Oh WOW, so chuffed to see my twofer at the top of this post and doubly so 'cos I sooo enjoyed creating them! Fabulous winner cards, congratulations to all!! I can't wait to see what is in store for the next challenge. Congrats to the winners! Awesome cards ladies!! Well done everyone and thank you for including me! Way to go people! Those cards are indeed winners. Congratulations to all of you. I love all the winner's cards. Congrats to you. Thanks Darnell and gang for helping us see so many projects by crafters. Fabulous collection of winners, Congratulations to all. are busier than Grand Central Station! I am so pleased I got an honourable mention on my first try at this challenge! Terrific group of cards -- all gorgeous and everything! Congrats to the winners! Congratulations to the winners ..... fabulous designs. Congratulations everyone and thanks for the constant inspiration for creating twofers! You all rock! Congrats to all and thanks Ladies for the shout-out! Congrats to winners and honorable mentions! Such a fun challenge and so much inspiration - thanks! !